Today we are going to review another binary options scam that abuses a famous name, it is called the „GoogleTrader“ and it is presented by Ben Williams. Williams is the supposed CEO of GoogleTrader and according to the presentation his trading software has a 100 % success ratio. This in itself is a proof that Google Trader is a scam. No binary options trading system can have only winning trades, this is a fact. 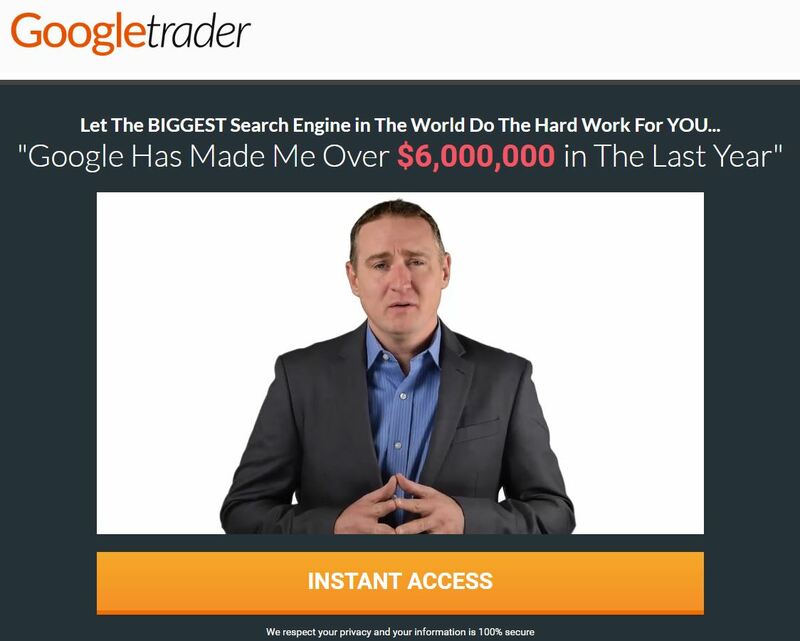 This binary options trading software supposedly uses Google to find the best market opportunities and enter trades. Why? Because “Google” knows everything.” Well, Google is a search engine, not a market predictor. So this is just an abuse, we have already seen scams abusing the Apple name, this is basically the same case. In the presentation video you will see fake testimonials that are made with paid actors. On the page you will see fake account statements and trades supposedly verified by a third party. But it is a lie, nobody verified these results, because they are fake. Another typical lie is that GoogleTrader is free. Because if you want to use it, you will first have to open a binary options trading account and deposit money into it, $250 is the usual minimum. Only then you’ll be able to trade with the Google Trader, but with your own money. So you will be risking and losing your money! Williams (or whatever his name is) is a binary options affiliate. He gets paid for every new trader he refers to his brokers. This is why he made up his story about the GoogleTrader, because he needs you to open a trading account and deposit. This is how he earns money. What happens then with your deposit, does not matter to him, so his software will lose your money. Forget all these free binary options robots, they do not work. Profits on binary options are possible only with learning, testing on a free demo and trading your own strategy. Is not a real address and was confirmed by multiple sources! Hello, I have had trade 2 win lost for 3days….see the result . It is very dangerous if you set up Autotrade. They choose asset only EUR/USD.. this is very strange trade. I don’t use anymore Google trade…. Do trade my strategy! Their auto trader doesn’t work I signed up for it set it to auto trader it won 3 and then lost 15 it only trades in EUR/USD very strange. I don’t think their signals are that good either I went on their recommendation one was at 98% the other at 94% advantage so I bought both in the time frame it recommended both lost. I was glad I bet high on the first 2 days I made some money then put it on low bids but lost the profit it in the next 3 days I turned it off as I still have my original deposit. 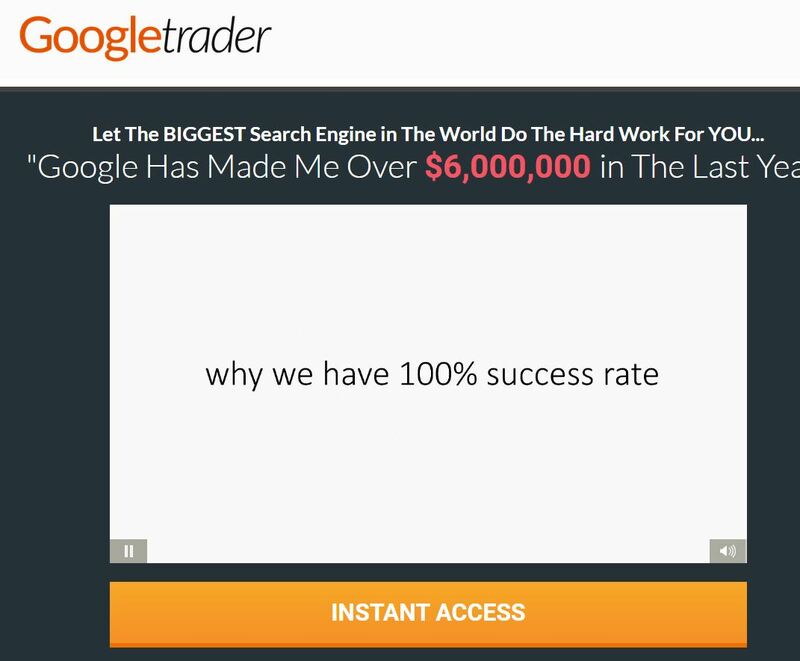 This GoogleTrader is 100 % scam…..because it made EUR/USD trades of $50.00 for me with 100 % fail rate (3 trades were total losses, but I luckily managed to sell off the 4th trade, before it had time to turn into a significant loss) ! And this is really some achievement, to fail 100 % with binary trading……when there are only 2 possible options to choose…….